When I first got this skirt from Romwe, I fell in love with it completely. It’s just so puffy and feminine, it makes me want to twirl and skip around a garden full of daisies and roses and sing along with birds and squirrels. (Yes, I am a Disney princess. I’ve been keeping this a secret for so long. Now, you know.) I can’t quite explain what the material of this skirt is. I’ve never worked with this kind of fabric as a designer, although I wish I have. It has a life of it’s own! Try as you might to squish it flat and it still stays in shape! The fabric is thick yet soft and light as a feather. It kinda feels I’m wearing really really thin cushion actually. I’d even joke to my friend that I’m wearing a comforter as a skirt. LOL! I really like it though. I like it so much I couldn’t decide what to wear with it! I had too many options! It’s a good problem so I’m not complaining. Originally, I wanted to show you 3 looks. But because I have so many pending blog posts already, I cut them down to 2. This first look is for those of you who are into the 3 Cs–clean, classy and chic. Nothing says this better than a crisp white blouse and stiletto pumps. I think it’s quite appropriate for the daytime event I was attending, the Christening of my second godchild. (Gosh, I’m getting old!) What do you think? I’ll post the 2nd look tomorrow. 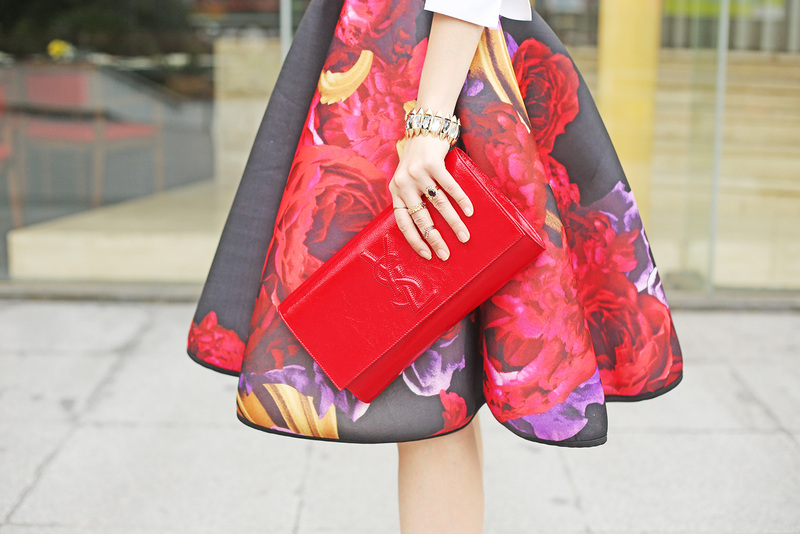 This is such a gorgeous skirt, Ms Camille! You are so classy with this look! And I already knew you were a Disney Princess, just like me.. Hahahaha.. I would do the same too if I was wearing this skirt.. Is there a name for this material? It can be wash, right? I’m sure it will look great!! Thanks Dan! Oh really? What a huge compliment! :) Thanks Star! It is :) Thanks Grace! Ive been looking for this skirt @Romwe but I cnt find it..
All I can say is, beautiful. I can view your photos from previous photos though. Your blog is really a beautiful garden in my heart, I feel beautiful princess in my eyes. See your dress and style feels you spent elaborate to dress up and make me feel gorgeous and beautiful. Especially the stiletto pumps very classy. I like it very much…..
Im in lové !! Where CAN i find the skirt ? You look so classy but never boring with this look, I love that u wore that gold belt too, everything is just sooo perfect! Mind if I ask if you have any upcoming event before this month ends, I really wanna see you in person, that’s my goal this 2014, I swear! Your hair is long pa jan hehe..
Sempre sensacional! Você é tão encantadora, a saia é linda demais, o visual ficou perfeito minha querida! Thank God for Google Translate :) Thanks Drika! nakakaloka sa linaw at laki yung mga photos mo! buti na lang flawless ang skin mo from head to toe kaya dedma sa chismis! btw, titang-Tita nga ang outfit mong ‘to! I can imagine when you age na and reach your mid-30’s, mapapadalas na ang mga outfit na ganito. Lakas maka-Female empowerment! haha! So soo chic, glamorous, and feminine. 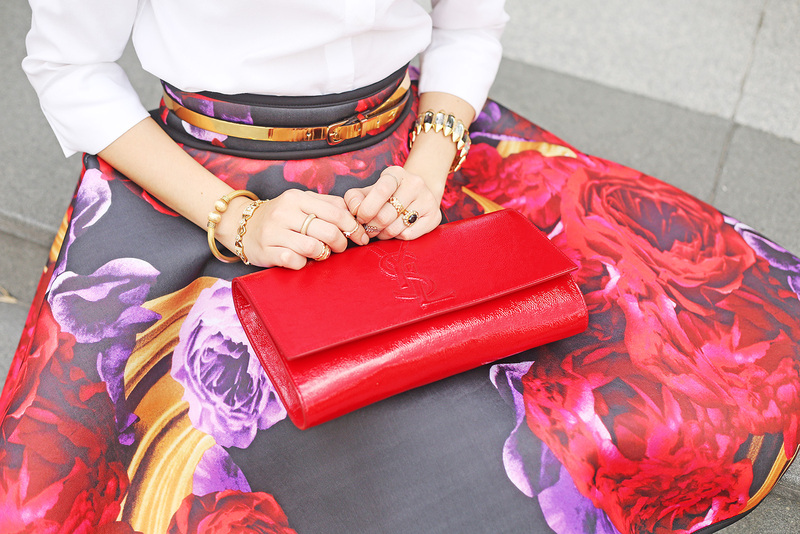 Love this dramatic skirt with beautiful florals. Can’t wait for look 2 now! LOL. A comforter! If only comforters were this chic and fashionable! Right? Haha! Then we’d all wear our comforters LOL! What a beautiful outfit! Your clothes are simply sublime. Definitely the kind of outfit to wear to church. Conservative. Looks great in you, by the way. Love it.I’m going to add this look to my not so big closet.. perfect for sunday mass. Dapat naman talaga ganito ang suot kapag nagsisimba or aattend ng binyag. Disente. Hindi agaw-atensyon. I agree! :) Thanks Jeramie! Wow, it is a statement skirt and it definitely takes the spotlight. The colours are gorgeous, like a fire blaze and the peek-a-boo effect of the necklace adds a glam touch to the overall look. Awww thanks Ren! Age ain’t nothing but a number! LOL! Enchanting! Im in love with the skirt! This skirt is so beautiful! Love it!